The Church of God in the Amazon region of Brazil is active and growing! The congregations are impacting their communities through outreach, evangelism, and social programs. While Beth and I have known the larger picture of the work of the Church of God for a few years here, we are starting to learn more in detail about their work and impact. This is the first part in a several part series about some of the different aspects of the work they are doing. 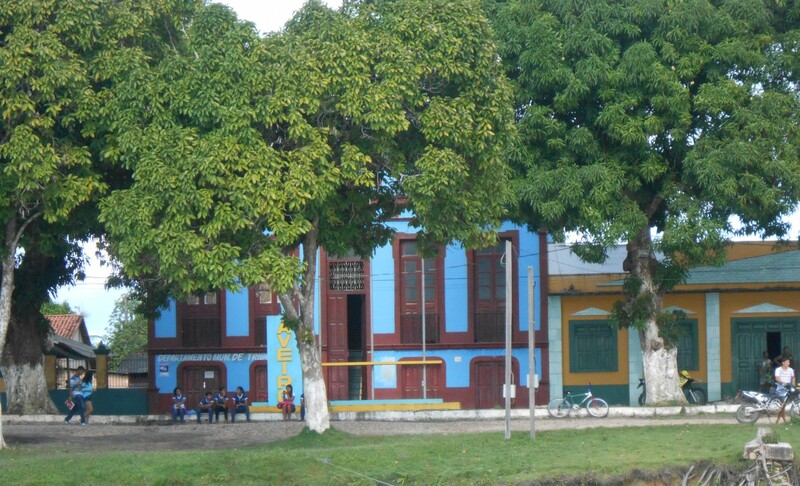 Since we arrived in Itaituba, we have been living at the Fazenda Maloquinha while we work on arranging to rent a house. Maloquinha is a working farm, small hotel and restaurant, and a recreation destination located 16km from the center of town. The proceeds generated by Maloquinha are used to support other social programs in the region ranging from after school care, schools, and Clinica Betel—the church run medical clinic. Francesca is the cook at Maloquinha during the week. Here she is putting the fresh milk into a milk separater to separate out the cream. Some of the products made from the milk produced here. of fresh farm cheese, doce de leite (kind of like caramel), butter, sweet cream spread, and a delicious onion flavored ricotta cheese. These products are served in the small restaurant as well as sold to people who come to visit. There are also many fruit trees including banana and mango as well as some newly planted cashew trees. There are also several hundred chickens on the property that produce the eggs used in the restaurant and that are sold to the community. Another aspect of the farming operation is the fish ponds. There are a series of ponds where tambaqui (pacu) and pirarucu (arapaima) fish are raised. This past weekend, we fished the ponds with a pastor and his family to provide fish for the restaurant to serve. While the farm is a draw for some people to visit, the restaurant, grounds, and amenities are the major draw for people. There is a small hotel as well as two small cabins that people frequently rent out. There are also pavilions around the property that can be used for everything from camping to wedding venues. During the week, it tends to be pretty quiet. On sunny days, it’s not unusual to see a few vehicles driving up to get an afternoon snack, walk the property, or take a swim in the river. But the weekends are when it really gets busy. On the weekends, the restaurant serves breakfast, lunch, an afternoon coffee and snack time, and then supper. Virtually all of the food save for some of the cakes and pizzas are cooked here in the kitchens by a staff made up primarily of members of various Church of God congregations. They are a well-tuned team who make and serve and incredible variety of food. Every person who visits, regardless of if they eat here, pays a R$3 (roughly $1) entrance fee to use the property. During the weekend you will see groups and families spending time just hanging out, playing soccer, swimming, taking pony rides (R$5 for 5 minutes), and playing on the variety of play equipment and swings. On the boat we took to get to Itaituba, I was chatting with a man who was traveling to Itaituba for the first time. He had a friend with him who is from Itaituba, and they asked where we planned to live. I told him I didn’t know yet, but we would be staying at Maloquinha for a few weeks while we found a house. The friend got excited and said, “That’s the place I’ve been telling you about! It’s the prettiest place in the whole city, and it is THE place to go on the weekends! You’ll love it!” And that is the sentiment I’ve heard from many people who visit. Not only is Maloquinha providing revenue to help support many COG programs around the region, but it is providing a safe, Godly recreation environment that is open to anyone who wants to visit.